1. Funko Pop! : I love Funko Pops, and I have an ever growing collection. And, one of my favorite things is reading the Funko Blog to see all the new licenses they are acquiring and what characters are going to be immortalized in tiny plastic format. So, I was incredibly excited when I learned that they are going to be releasing a set of Parks and Recreation Funkos in 2017. Currently, they are planning Pops! of Leslie Knope, Ron Swanson, Tom Haverford, April Ludgate, Andy Dwyer, and Li’l Sebastian. But, I haven’t given up hope that we will get Anne Perkins and Ben Wyatt eventually. I mean, can you have a Leslie Knope without an Anne or Ben? I really don’t think so. You can visit the Funko Blog here to see more awesome stuff. in the mood for a quirky fun comedy movie. And, I love Anna Kendrick. What I was not expecting was to love it soooo much. Its basically a romantic comedy/hit man mash-up that full of laughs and heart. I know that is has a not great rating on Rotten Tomatoes (42%), but it has quickly become one of my favorite films. 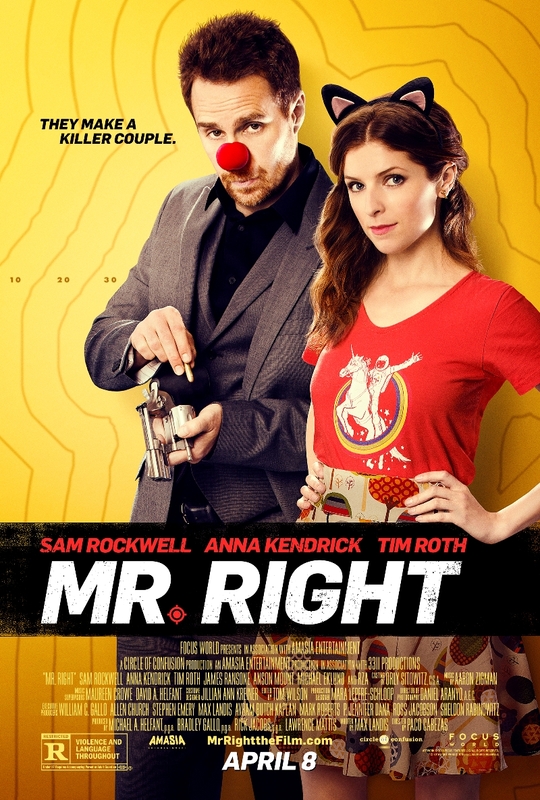 It doesn’t take itself too seriously, the chemistry between Sam Rockwell and Anna Kendrick is fantastic, and I laughed for almost the entire film. I highly recommend it! 4. Marvel’s Agents of S.H.I.E.L.D: I love this show. And, I have loved the show since the very first episode. I know the popular narrative was that the first season wasn’t very good, but that its gotten better. I’m in the “its always been good” camp, but I have to say that Season 4 has been exceptional. I love the concepts of artificial intelligence, so the introduction of LMDs this season has been great. Plus, we get Agent Koenig back this season which I fully support. 5. Nix Super Skinny Eye Marker: I am definitely not a make-up guru, but I am incredibly impressed by those with superior make-up skills. And, I really like watching make-up videos on YouTube. Especially, the Make-up Book Tag – its the combo of two awesome things! But, I did try a new eyeliner this month that I absolutely love. Its the Nix Super Skinny Eye Marker. Its so easy to use, and I love the way it looks. What kinds of things have you been loving this year?? I don’t have any Funkos, but I think I need a Ron Swanson and Lil’ Sebastian!! Firs of all, I will have to get me a Leslie Knope Funko when they are released because she is my role model for life. And secondly, I LOVE Agents of S.H.I.E.L.D.! I am also in the “it’s always been good” camp. I loved the first season with “good” Ward. They were such a sweet little family. I’ve loved every season. Everyone needs a Leslie Knope! Yes! I loved the first season. “Good” Ward was the best – and I loved the developing relationship between him and Skye. It was such a fun dynamic. Yes! So many great movies. I am dying to see Beauty and the Beast. I have such amazingly high hopes for it. I hope you get a chance to watch Mr. Right, and you love it! OMG!! The first three… YES YES YES!!!! I had no idea they were planning on releasing Parks&Rec Funkos!!! BUt that’s just a perfect idea!! What a fun bunch it was!!! I totally get where you’re coming from on the Beast – he looks a little too tame. Not nearly as scary as I was expecting. But, everything else looks so beautiful – especially the set designs. I can’t wait to see how it stacks up against the original!